Handcrafted Wooden Memorial Benches made from solid hardwood, durable and made to last. ‘Rest, and be thankful’ the old Yorkshire adage directs, and Woodcraft UK offers you the perfect opportunity to heed this traditional invitation, with an extensive range of wooden garden benches and outdoor chairs designed for rest and relaxation. Woodcraft UK’s garden benches are expertly crafted and constructed from carefully selected materials. Each is a long-term investment; a masterpiece of constructional durability and aesthetic integrity that will maintain its value despite the passage of time and the rigours of the elements. In the two decades since its inception Woodcraft UK has withstood all pressures to compromise and has steadfastly maintained the highest standards of quality in terms of design, materials and craftsmanship. It takes very special creations to enhance Nature itself, but Woodcraft UK’s superb collection of garden benches, outdoor chairs and memorial seats feature classic designs that can bring an additional element of beauty to any landscape. Hardwood outdoor chairs for the garden and patio. 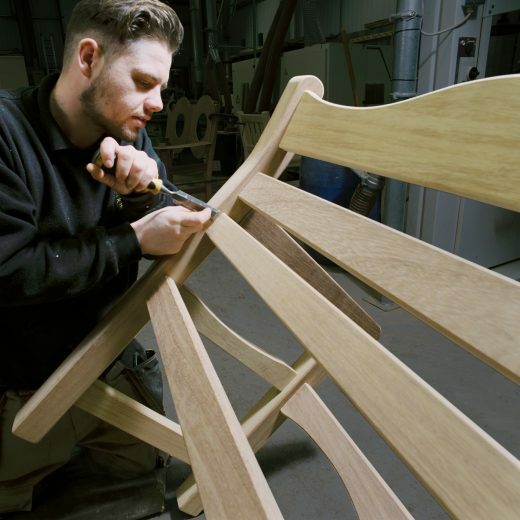 Woodcraft UK’s outdoor chairs are professionally hand crafted and constructed. Using the finest hardwoods and softwoods our outdoor chairs are built to withstand the elements. All of these hardwood outdoor chairs compliment our tables and benches in the same range. Our range of outdoor chairs encompasses classic garden furniture designs and contemporary outdoor seating using quality materials such as oak, teak and iroko. All of our garden chairs and outdoor seating have been handcrafted to the highest standard providing both elegant styles and sustaining durability. These wooden chairs are perfect to suit your needs whether it is a single garden chair, wooden park seating, forest picnic chairs on National Trust or English Heritage sites. We offer a full choice of single seating, double seat and bespoke chairs that complement our range of luxury wooden garden furniture. Why not choose from our range of Garden Tables as a perfect companion to your outdoor seating requirements. Woodcraft UK, in Beverley East Yorkshire are pleased to offer you this exclusive range of garden chairs. This range of outdoor seats offers exceptional quality of craftsmanship and outstanding value for money. We believe that you won’t find better value in the UK for outdoor seating. Bespoke garden benches and Memorial seating engraved with your commemorative inscription. Our garden benches come with a range of options but if you are looking for a unique design to suit your environment or a specific size to fit a particular space then Woodcraft UK can create the bespoke bench to meet your requirements. Woodcraft UK’s outdoor benches are expertly crafted and constructed from carefully selected materials. Each is a long-term investment; a masterpiece of constructional durability and aesthetic integrity that will maintain its value despite the passage of time and the rigours of the elements. In the two decades since its inception Woodcraft UK has withstood all pressures to compromise and has steadfastly maintained the highest standards of quality in terms of design, materials and craftsmanship. It takes very special creations to enhance Nature itself, but Woodcraft UK’s superb collection of outdoor benches feature classic designs that can bring an additional element of beauty to any landscape.